Our Online Taxi booking system allows you to Book your cab within minutes. Dewsbury Cars is the most trusted name when it comes to Airport journeys. Now you can download mobile apps using multiple options. 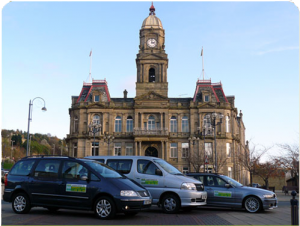 Dewsbury Cars a family run business offering a range of services including taxi, private hire and mini buses. Centrally located, we are ideally placed to serve both domestic and commercial customers across town with highly affordable taxi hire. With a wealth of experience, our professional and reliable team offer a comprehensive range of private hire cars, 4 – 5 – 6 – 7 – 8 seat vehicles, local and long distance transportation, as well as airport transfers among many others. Our fully computerized booking and dispatch system enables the provision of a fast, efficient and reliable taxi service, with accurate taxi tracking and estimated time of arrivals improving the reliability of our taxi and private hire solutions. We have been in business for around 18 years. Formed in 1991 as Town Cars but the name soon changed… just a year later! We have over 14 years experience between our drivers in the taxi trade with excellent knowledge of the local and surrounding areas. All our cars are very comfortable and in pristine, clean condition. We use state-of-the-art data system technology for satellite navigation and digital communication. We cater for trips to airports, weddings, school runs, cinemas, shopping, couriers and all contract work at highly competitive rates. We hold competitions with local business and press as well as hold local community forums and support local charities. Call Back & Text Back Service available.